Sebastian Uvira‘s father Eduard was a very popular hockey player in both Czechoslovakia (where he was born) and in Germany, so it seems only fitting that the younger Uvira is following in his father’s footsteps of excellence. Uvira, who represents Germany internationally, forwent a contract with Augsburger Panther of the Deutsche Eishockeyliga to play for the Oshawa Generals, who made him the 46th overall pick in the 2011 CHL Import Draft. The handsome import immediately fit in with the forward corps on the Generals, scoring a goal in his first OHL career game. Uvira also did not shy away from physical play, getting into a fight in only his fourth game against Adam Payerl of the Belleville Bulls. When all of Oshawa’s NHL draft picks returned from training camp, however, Uvira’s point production began to dwindle. He did, however, manage to spark his team’s offensive attack on a couple of occasions; two early season goals of his have been credited as being the first goal of the game for Oshawa. By the time the first week of December came by, he was in need of a boost in morale. He went home to play for Germany at the 2012 World Juniors and he helped the team win gold, leading them to promotion. (As a 1993-born player, he is eligible to return to the tournament next year.) Uvira returned to Oshawa and he was like a man reborn; he scored ten points (six goals, four assists) in 12 games. This included his first two-goal game of his OHL career on January 6, 2012, against the Kitchener Rangers and fellow countryman Tobias Rieder. Uvira finished his first OHL season with 22 points (13 goals, nine assists) and 63 penalty minutes in 55 games; an injury, however, kept him out of the playoffs. Rumours still persist that he may join Augsburger Panther for the 2012-13 season but whomever becomes the new head coach in Oshawa should try to keep him in North America. Taylor Fielding is, by nature, a defenceman but circumstances in 2011-12 have had him converted into a forward. 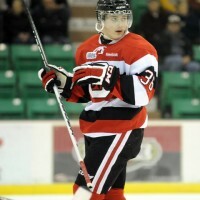 The Ottawa 67’s had one of the deeper blueline corps in the OHL this past season, which included captain Marc Zanetti, 2012 NHL Entry Draft hopeful Cody Ceci, and Slovak hulk Michal Čajkovský. The team also had two rookies, Sean Callaghan and Mike Vlajkov, hoping to make an impact. 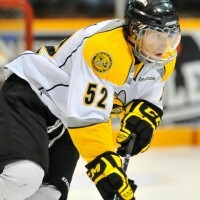 Fielding’s chance of making the top pairings was even further hindered when Ottawa acquired overager Daniel Broussard from the Sarnia Sting. Chris Byrne decided to put Fielding as a right winger on the fourth line for the 67’s. It worked. On November 2, 2011, he had his first goal of the season, something that it took him until nearly the last game of the regular season the year before. Just as he was settling into his new role, though, Fielding suffered an injury that kept him out of action for nearly three weeks. By December, Fielding was getting back into his groove. He scored three points in December and in January, as well as two points in February. He finished the season with 11 points (three goals, eight assists) in 52 games, racking up 49 penalty minutes, as well. 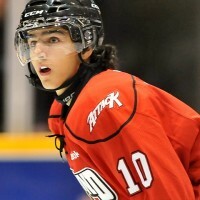 Joseph Blandisi is probably one of the best feelgood stories of the 2011-12 OHL season. 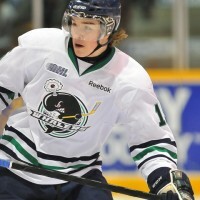 A 1994-born forward, he was chosen in the 2011 OHL Priority Selection after slipping through the draft the year before. He came into the OHL with seven junior A games to his credit and coming to a team now rebuilding after winning the OHL championship. As well, the team had a new head coach and a new philosophy. Blandisi made the team and he immediately showed why. He scored his first OHL career goal in his first game; to add, the goal was shorthanded. He followed that up with an incredible October, a month in which he scored nine points (four goals, five assists) in 13 games. 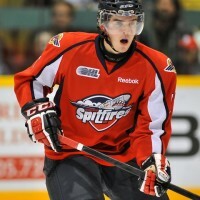 On November 26, 2011, he had his first two-goal game in the OHL. His offensive production may have stagnated at times but he was doing many things right for new head coach Greg Ireland. Blandisi was equally sound defensively, finishing the season as a +4; he also had elements of physicality, recording 72 penalty minutes. However, it was his special teams play that got him noticed; he scored five powerplay goals during the campaign. In a complete 68-game schedule, Blandisi scored 31 points (17 goals, 14 assists). He is now in the rankings for the 2012 NHL Entry Draft, something that seemed almost inconceivable this time last season. Alan Quine showed in 2011-12 how any player’s confidence can soar after being drafted to the NHL. A third-round pick of the Detroit Red Wings in 2011, Quine set out to merit why he was a second-overall pick in the OHL Priority Selection. It was, after all, his first full season with Peterborough after being acquired the season before from Kingston. He immediately showed that he was on pace for a career season by scoring a goal and an assist in the first game of the year; he had six points in the first four games of the year. His point production stalled a bit in October but he started to improve upon that in November. In that month, he recorded 14 points (five goals, nine assists). During the upswing in offence, another upswing began to arise; he was also recording many more penalty minutes than he had in previous campaigns. After only registering eight penalty minutes in each of his first two seasons, he was on pace to break that mark, which he did on December 11, 2011, when he got into his first OHL career fight against Craig Hottot in Sarnia. Quine actually got nine penalty minutes in December alone. 2012 started great, with a three-point game, including the game-winning goal on a penalty shot in overtime against the Sudbury Wolves on New Year’s Day. However, a hit sustained in that game resulted in a minor shoulder injury that kept Quine out of the lineup for almost two weeks. By this time, the Petes were already missing Matt Puempel (concussion) and Slater Koekkoek (shoulder injury) for the rest of the season. Quine did not miss a beat upon his return to the lineup and he had one of his best OHL games ever at the expense of his former team, scoring four points (two goals, two assists) on January 26, 2012, against Kingston. After two more solid months, Quine finished the season with 70 points (30 goals, 40 assists); he also tied for third in the OHL with six game-winning goals. The Petes missed the playoffs but Quine is helping to make them more respectable for at least one more season. 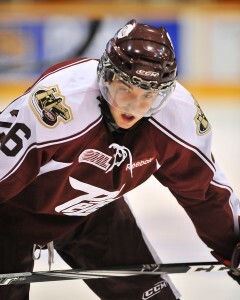 Mitchell Heard enjoyed a renaissance during the 2011-12 OHL campaign. After attending the training camp of the Toronto Maple Leafs in 2011, he returned to Plymouth willing to do whatever it takes to prove that he was a bona fide threat for the Whalers. All aspects of the game were in a major upswing. Heard scored a goal in each of the first four games of the new season and, by the end of October, he already had eight. His penalty minutes were also going up; during a game against Mississauga on the 23rd of that month, he accumulated 12 in that contest alone. Heard had one of his best OHL career games a month later when he scored four points (two goals, two assists) on the 12th, an 8-0 win over the Sault Ste. Marie Greyhounds. A ten-point November led to two back-to-back 12-point months. He had a pair of two-goal games in December. The dawn of the new year did not stop Heard; rather, it kept him going. He finished the season with career totals in all but assists; he tallied 57 points, including 29 goals, and 111 penalty minutes in only 55 games. To add, Heard had ten powerplay goals and five game winners. He also played considerably well during the playoffs, recording 11 points. 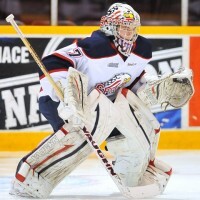 Jake Paterson may have started the 2011-12 OHL season as a backup but, as the season progressed, it became obvious that he was about to be the go-to guy in net for the Saginaw Spirit. He played in five games the season before and he did not lose in regulation in any of them. The Spirit initially did not want to rush their rookie goalie into the rigours of being a #1 netminder but his talent proved otherwise. He won his first start of the 2011-12 campaign and, even though he struggled with consistency for a time, he noticed that he was not the only one on the team to go through such a funk. The team as a whole struggled with finding their groove and it resulted in Todd Watson being fired. Once Greg Gilbert came in and took the reins, he instilled even more confidence in Paterson. This was even further intensified when Tadeáš Galanský left the team, looking for a trade, and the Spirit instead brought in Clint Windsor from the Barrie Colts. Paterson had highs and lows all season, including a four-game winning streak in October. There were several times where he faced many shots, despite the calibre of defence in front of him, including a game on November 11, 2011, against Ottawa where he faced 54. On February 4, 2012, Paterson made 40 saves against the Erie Otters to record his first OHL career shutout. He finished the season with an 18-18-0-3 record, a 3.42 goals-against average and a .904% save percentage in 42 games. He was also instrumental in helping the Spirit win their first-round playoff series against their heavily favoured opponents from Sarnia. Alex Basso may have had an injury-filled 2011-12 OHL season, his first with the Sarnia Sting, but that did not stop him from having a career year. He appeared in only 44 games, nursing two injuries during the campaign. Basso immediately made an impact upon the Sting when he joined them this past OHL season after spending the last two years with the Belleville Bulls. He scored a goal and an assist in his first game with Sarnia on September 23, 2011, against the Erie Otters. He followed that up with an incredible October that saw him score 13 points, 12 of which were assists, including a four-assist performance against the London Knights on the 16th of that month. He had a three-point game, one goal and two assists, the night before. After a subpar November, Basso suffered the first of his two injuries, a broken jaw, from this past season. It kept him out of action for all of December. When he returned in January, Basso continued his stellar play. In fact, on January 13, 2012, against Mississauga, he had his first two-goal game in his OHL career. February also started out great, including a three-assist game on the 12th against Sault Ste. Marie. In the next game against Guelph, however, things took another turn for the worse when Basso injured his hand. He was out of action for nearly another month. He did manage to put up career-best numbers by scoring 36 points (nine goals, 27 assists) and, for the first time in his OHL career, he was on the positive side of the plus-minus ledger with a +5 ranking. 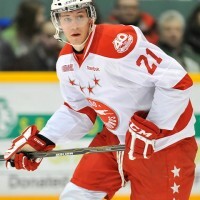 Brandon Alderson was acquired by the Sault Ste. Marie Greyhounds prior to the start of the 2011-12 OHL season from Sarnia and it seems to have paid dividends. He tallied an assist in his first game with his new club and, in his second game, he had a goal and an assist. He followed that with an impressive October that saw him score ten points (five goals, five assists) in 13 games. Alderson’s point production did trail off somewhat but he found his way onto the scoresheet in another way, recording several penalty minutes in games where he was not producing offensively. Alderson had 12 penalty minutes in November, 18 in December (thanks mostly to ten in one game) and 14 in January. His goal scoring also started to come back at the beginning of the new year, scoring three goals in nine games in January. 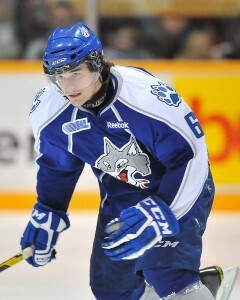 On February 3, 2012, Alderson recorded three points, one goal and two assists, against the Sudbury Wolves. March was not quite kind to him but he did manage to record his third OHL career two-goal game on March 17, 2012, a wild game that the Greyhounds won 10-9. Alderson had career bests in every category in 2011-12; he scored 39 points (17 goals, 22 assists), tallied 81 penalty minutes and was a +5 in 65 games. Sault Ste. Marie, however, missed the playoffs, making it the third year in a row that Alderson has missed the postseason. Going into his overage campaign in 2012-13, it would be nice to see him perform in the playoffs before his OHL career ends. Nathan Pancel made the Sudbury Wolves full-time during the 2011-12 OHL season after being named the top rookie in the Central Tier 1 Hockey League in 2010-11. He went pointless in his first five OHL career games until he scored his first two OHL career points, including his first goal, on October 7, 2011. Most of October was not very productive for Pancel but, on October 30th, he had his best game of the season, scoring four points (two goals, two assists) in a 4-1 victory over the Brampton Battalion. The next game, which was on November 4th against Oshawa, Pancel scored three points (one goal, two assists) in a 6-4 Wolves win. The rest of 2011 was inconsistent at best. He scored only three points in 14 games to finish off the calendar year. Pancel went into 2012 with renewed confidence. He scored eight goals in 13 games in January, including three two-goal games; he had two more two-goal games in February. In fact, Pancel tallied 17 points (eight goals, nine assists) in a nine-game point streak between January 27 and February 11, 2012. One of those games was another four-point contest, scoring one goal and three assists in an 8-4 win over the Peterborough Petes on February 4, 2012. Pancel finished the season with 44 points (23 goals, 21 assists) in 63 games; he was also +15. In addition to his scoring prowess, he also showed that he can hold his own in a fight, scrapping twice during the season. One of his fights came on March 18, 2012, against the Kingston Frontenacs when he dropped the gloves with his good friend Warren Steele. Michael Clarke may have went pointless in an eight-game callup to the Windsor Spitfires during the 2010-11 OHL season but it was the 2011-12 campaign where he shone. He scored a goal in the first game of the season and he got another in the next game. His seventh game, which was in his hometown against the London Knights, was one of his best all season; he recorded his first OHL career hat trick, as well as recorded an assist, for a four-point game in a 5-2 Spitfires victory. Eight days later, Clarke scored two goals and an assist in a 4-2 win over the Erie Otters. He struggled with consistency in terms of his point production but he excelled both defensively and physically. He got into three fights in October and November combined. Clarke became one of the better all-around players in Windsor, taking the burden off of players such as Alexander Khokhlachev, Kerby Rychel and Zack MacQueen. A six-point November was followed by two months in which he scored only five points in 20 games. Clarke did manage to score a goal and an assist on February 3, 2012, against the Owen Sound Attack, a 6-5 overtime win for the Spitfires. On March 11, 2012, Clarke had another one of his best games in his OHL career, scoring a goal and three assists in a 7-5 Windsor victory over Sarnia, a game in which he was named first star. In a complete 68-game schedule, Clarke scored 36 points (15 goals, 21 assists) and 81 penalty minutes, quite substantial for a first-year player on a team rebuilding with youth.